RUPERT- On Tuesday, October 10th, a group of interested landowners attended a Walk in the Woods tour on Alan Calfee’s 591 acre certified Vermont Tree Farm in Rupert. Calfee is a consulting forester and the owner of Calfee Woodlot Management, LLC. He led the tour with conservation biologist, Steve Hagenbuch, of Audubon Vermont. The tour was hosted as part of the Woods, Wildlife and Warblers program to demonstrate the management activities that Calfee has done in his woodlands with the support of the National Fish and Wildlife Foundation. The work focused on enhancing wildlife habitat while still remaining productive for timber, and increasing the forest diversity. The Woods, Wildlife and Warblers program focuses on woodland owners in Bennington, Windham, Windsor and Rutland counties, and is a collaborative effort amongst the American Forest Foundation, the Vermont Tree Farm Committee, and Audubon Vermont. 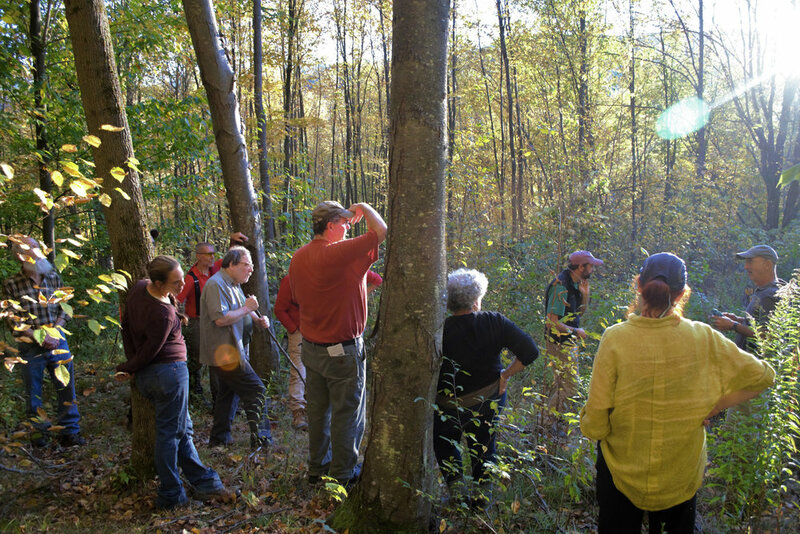 The program focuses on connecting southern Vermont woodland owners with resources and professionals to help accomplish their goals for their land and better care for their woods. As Vermonters, our forests are important to us, and what we do can have an impact not just locally, but globally. Vermont forests are home to some of the highest concentration of bird species breeding in the continental United States—meaning this region provides rich, essential habitat for all local wildlife species. Thus, Vermont woodland owners are essential to successful bird and wildlife conservation. Prior to the walk, about 30 acres of Calfee’s property had been treated for invasive plant species. 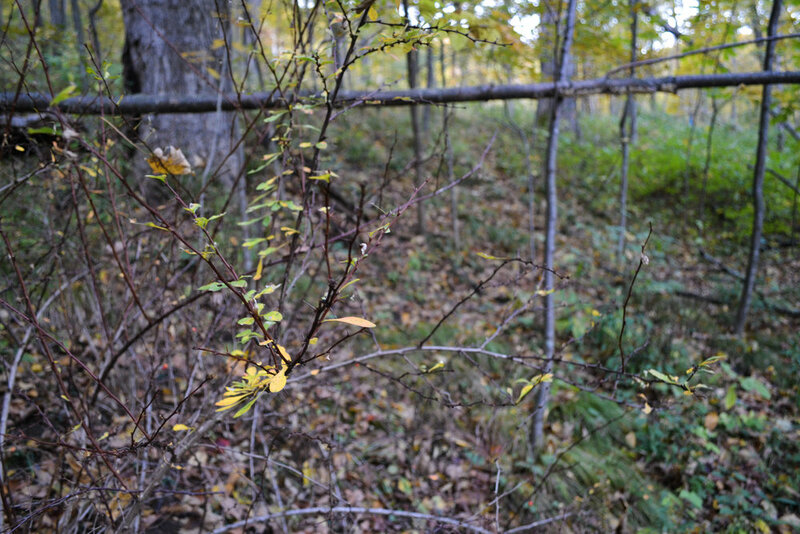 Species treated included common buckthorn, multiflora rose, and honeysuckle, all of which outcompete the native tree and understory species he wants to encourage. The property has sugar maple stands and he wants to keep them healthy and make sure invasives don’t outcompete them in the future. Calfee’s forest management plans include the removal, or “weeding,” of the low-quality trees to allow other trees to flourish and provide homes for wildlife. This will encourage the growth of native trees in the future that will hopefully outcompete the invasives in the area thanks to the invasives treatment this fall. “As soon as the area gets sunlight in, it may encourage native growth even more. That is where the wildlife component comes in. The first two layers of the forest are where birds are most active and nesting,” says Hagenbuch about the property. “Since he has red oak and sugar maple seedlings, if we can get little patches open in these areas it will be a start to benefit wildlife...it’d be great if red oak were a component of that to encourage and adapt to possible climate change,” explains Hagenbuch. Calfee has also created young forest habitat throughout his property, which supports certain species like the chestnut-sided warbler. When those areas begin to mature after about fifteen years they’ll attract a variety of different species. Calfee has done great work on his property so far, but he is not done. Though the desired results for Calfee’s plan may take up to 45 years, working to improve the quality of his woods for both timber and wildlife is his primary focus.